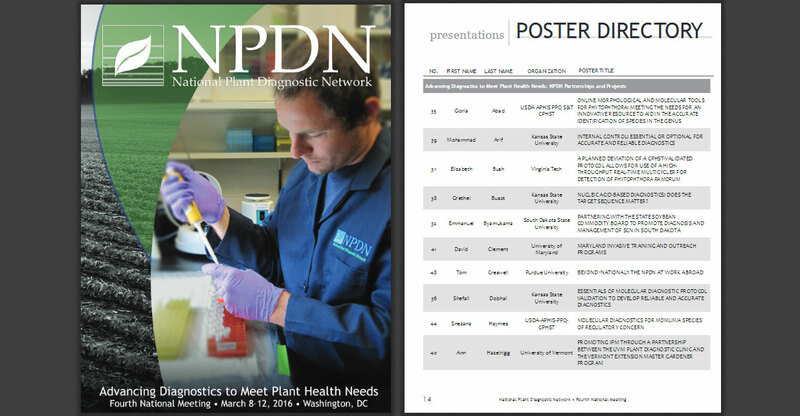 This selected set of IDaids spotlights five posters displayed at the 2016 National Plant Diagnostic Network (NPDN) 4th National Meeting, a four-day event consisting of workshops, technical presentations, and poster sessions concentrating on topics for “Advancing Diagnostics to Meet Plant Health Needs.” NPDN is a collaborative network of state, federal, university, and other plant diagnostic organizations that work to safeguard American agriculture. The Purdue Plant & Pest Diagnostic Laboratory and APHIS collaborated to identify and confirm the first U.S. record of Phyllachora maydis. 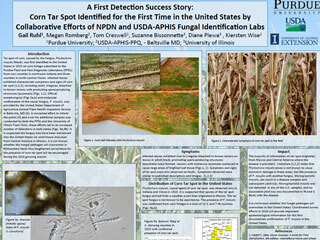 The poster covers identification, symptoms, distribution, impact, fungus and symptom images, and a map of affected counties. This lab’s poster describes and illustrates four featured pests and diseases: the short-winged blister beetle, spinach crown mite, and the diseases fusarium wilt and bacterial canker. 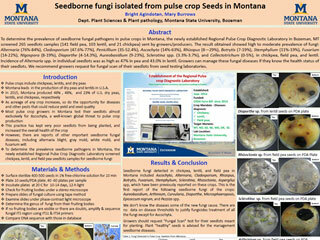 The Regional Pulse Crop Diagnostic Lab screened 265 seedlot samples and found high to moderate prevalence of fungi. 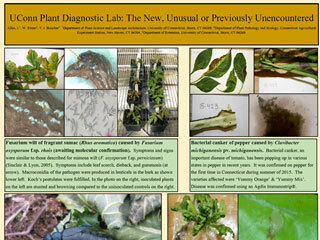 The poster includes photos of cultures (top and bottom) and fungal conidia. 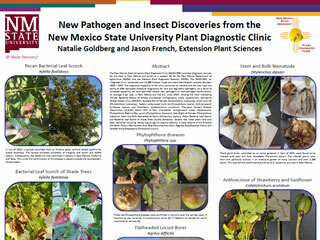 This NMSU lab identified many new diseases and disease hosts, and several are displayed here: bacterial leaf scorch, Phytophthora diseases, stem and bulb nematode infestation, anthracnose, and flatheaded locust borer infestation. 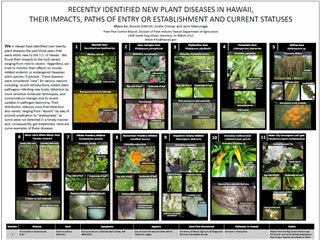 This poster from Hawaii highlights eleven new plant diseases and their hosts; each of the eleven shows the healthy and unhealthy plant, leaf symptoms, and close-ups and micrographs of the pathogens themselves. A helpful chart is included.